Olivia brings you the BEST of the Mediterranean as we travel in luxury, exploring the hidden treasures of Italy and ending in Monte Carlo, Monaco. 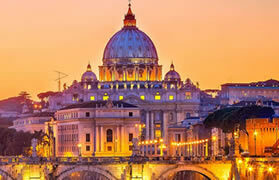 Begin your journey along Italy’s Mediterranean Coast in Rome, the Eternal City. Spend the day and night in Sorrento, the city famous for winding cliffside roads and incredible seascapes where you can savor coastal fare and delicious gelato (because even in October it will feel like summer!). The port city of Livorno is the gateway to the magnificent art and architecture, palaces, churches and museums of Florence, as well as Pisa’s famous leaning tower. 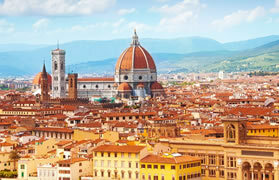 You’ll spend two full days in Livorno, affording you the opportunity to see both Florence and Pisa during our stop. 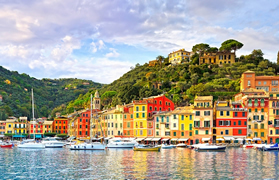 When you picture classic Italian romance, the setting could very well be Portovenere and in Portofino you’ll discover charming waterside restaurants and a tiny town of pastel houses lining the shore of a small harbor full of sleek yachts. 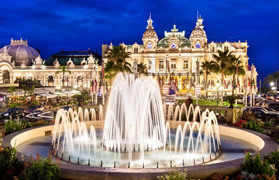 End your journey in Monte Carlo, home to the legendary Grand Casino and the Monaco Grand Prix and explore the breathtaking beauty of the city. 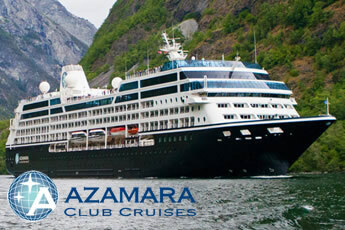 Azamara Cruises is opening the door to unforgettable AND unique experiences with Azamara Pursuit. You’ll never feel crowded in the comfortable social spaces of our bars, restaurants, lounges, Casino and Cabaret. Their attentive staff is always ready to offer a complimentary bottled water, soft drink or fresh towel. 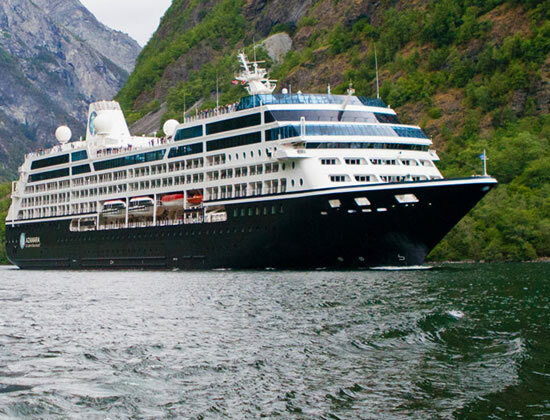 Staterooms feature modern amenities, furnishings, and European linens. 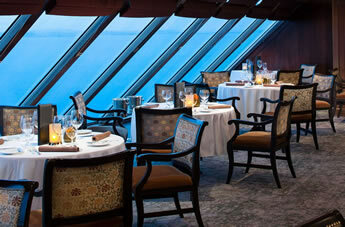 And one of the greatest features of this ship is the large number of staterooms with verandas. There’s nothing better than opening your door to the fresh sea air and views. 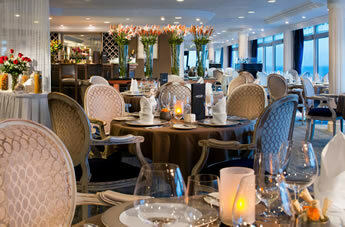 Seven restaurants, cafes and lounges, a refreshing pool, sun-drenched decks, a revitalizing spa... the list goes on. 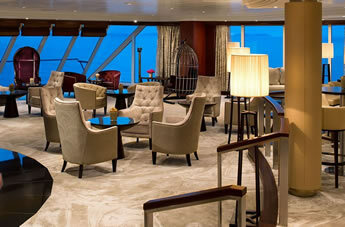 There are so many areas to explore onboard Azamara Pursuit. Escape to a private retreat of polished style, featuring contemporary decor, luxurious linens, plush cotton robes and slippers, French bath products, fresh flowers, turn-down treats, and 24-hour room service. 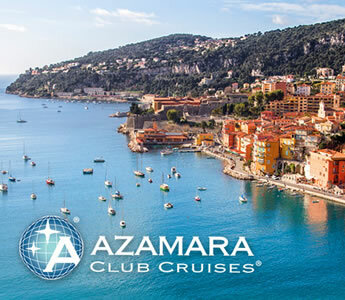 So many areas to explore onboard Azamara Pursuit - Seven restaurants, cafes and lounges, a refreshing pool, sun-drenched decks, a revitalizing spa...the list goes on. One of the best ways to experience the jaw-dropping sights is from your private veranda. It’s just one of the many benefits exclusive to your wonderfully spacious suite aboard Azamara Pursuit. 07 Oct A Day at Sea! Always enchanting, the Eternal City will captivate you—no matter how many times you visit Rome. Walk in the steps of gladiators at the Coliseum, channel your inner statesman at the Forum, or gaze up in wonder at Michelangelo's masterwork at St. Peter's Basilica. Pasta and vino are a must, and there are plenty of places to relax and refuel after a day of exploration. Looking out from Sorrento is the isle of Capri. The island is divided into two main parts, Capri and Anacapri. Capri is full of Italian luxury, with designer stores and five-star hotels lining the streets, while Anacapri is slightly more down-to-earth. Take a relaxing chairlift ride to the very top of the island, as the views are jaw-droppingly gorgeous. It’s time to relax, sip a glass of wine or sparkling water and catch up with friends. Get a massage at the spa, sunbathe at the pool, or just sit and enjoy gorgeous views of the Mediterranean Sea. 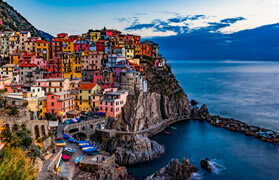 When you picture classic Italian romance, the setting could be Portovenere. Stroll along winding cobblestone streets to San Pietro Church, which sits upon a site that’s believed to have once been a temple to Venus. And be sure to visit Grotta Dell’Arpaia, where poet Lord Byron used to relax during the 1820s. It’s easy to see how he was inspired to write some of his most romantic works here. 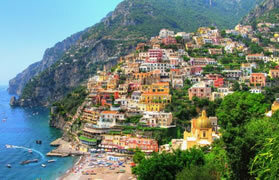 Picture a tiny town of pastel houses lining the shore of a small harbor full of sleek yachts, crowned by a castle. Throw in charming waterside restaurants specializing in seafood, and a national park with miles of hiking trails among chestnut and olive groves, where you can work off the pasta that in Italy is just the first course, between the antipasto and the main. Deck 8. (Approximately 266 sq.ft. with 60 sq.ft. veranda). Club Continent Suites are a wonderful refined home away from home and feature a queen size bed (convertible to two twins), comfortable sitting area, a spacious, newly decorated bathroom – either with a tub or shower, a 55” flat-screen television, refrigerator with mini-bar, floor-to-ceiling sliding glass doors with private veranda, one free bag of laundry service, afternoon in-suite tea service, complimentary bottles of specialty spirits, mixers included, complimentary internet (235 minutes) and complimentary specialty dining. Deck 6, Deck 7, Deck 8. (Approximately 175 sq.ft. with 46-64 sq.ft. veranda). Enjoy a room with a view and a veranda to take in the ocean breezes. These staterooms feature a queen size bed (convertible to two twins), floor-to-ceiling sliding glass doors, private veranda, sitting area, flat-screen television and refrigerator with mini-bar. Book now to get $500 pp off Early Bird! 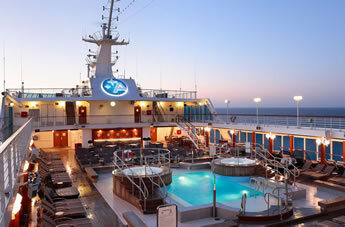 Deck 8. (Approximately 175 sq.ft. with 40-64 sq.ft. veranda). Enjoy a room with a view and a veranda to take in the ocean breezes. These staterooms feature a queen size bed (convertible to two twins), floor-to-ceiling sliding glass doors, private veranda, sitting area, flat-screen television and refrigerator with mini-bar. Book now to get $500 pp off Early Bird! Deck 6, Deck 7. (Approximately 175 sq.ft. with 40-64 sq.ft. veranda). Enjoy a room with a view and a veranda to take in the ocean breezes. These staterooms feature a queen size bed (convertible to two twins), floor-to-ceiling sliding glass doors, private veranda, sitting area, flat-screen television and refrigerator with mini-bar. Book now to get $500 pp off Early Bird! Deck 4, Deck 5, Deck 6. (Approximately 170 sq.ft.). Enjoy a room with natural sunlight and a view. These staterooms feature a queen size bed (convertible to two twins), flat-screen television and refrigerator with mini-bar. Deck 8. (Approximately 158 sq.ft.). These comfortable interior staterooms feature a queen size bed (convertible to two twins), flat-screen television and refrigerator with mini-bar. Deck 7. (Approximately 158 sq.ft.). These comfortable interior staterooms feature a queen size bed (convertible to two twins), flat-screen television and refrigerator with mini-bar. Deck 6, Deck 7. (Approximately 158 sq.ft.). These comfortable interior staterooms feature a queen size bed (convertible to two twins), flat-screen television and refrigerator with mini-bar. Deck 4. (Approximately 158 sq.ft.). 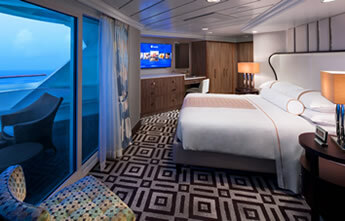 These comfortable interior staterooms feature a queen size bed (convertible to two twins), flat-screen television and refrigerator with mini-bar. 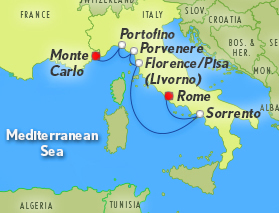 We will announce our exciting pre-cruise stretcher in Rome and post-cruise stretcher in Nice, France with a Paris extender approximately 9 months prior to the cruise.